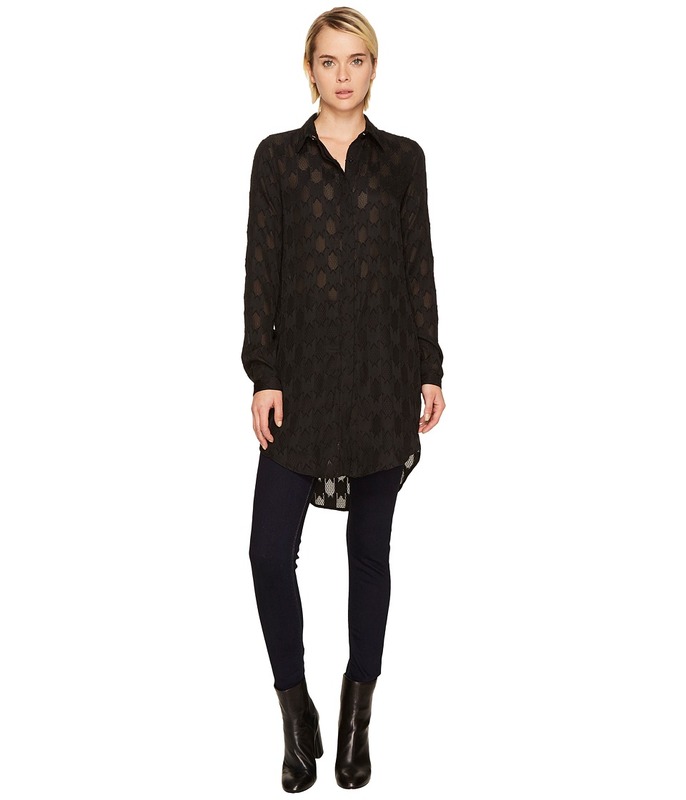 Keep your style full of confidence and grace wearing the Versace Jeans High-Low Tunic Button Up. Point collar. Front hidden button-up closure. Long sleeves with button cuffs. Allover tonal hounds-tooth style print. High-low shirttail hemline. 100 percent polyester. Secondary: 100 percent viscose. Professional dry clean only. Imported. This item may ship with an attached security tag. Merchandise returned without the original security tag attached or a damaged tag may not qualify for a refund. Measurements: Length: 39 in Product measurements were taken using size 40 (US 2). Please note that measurements may vary by size. 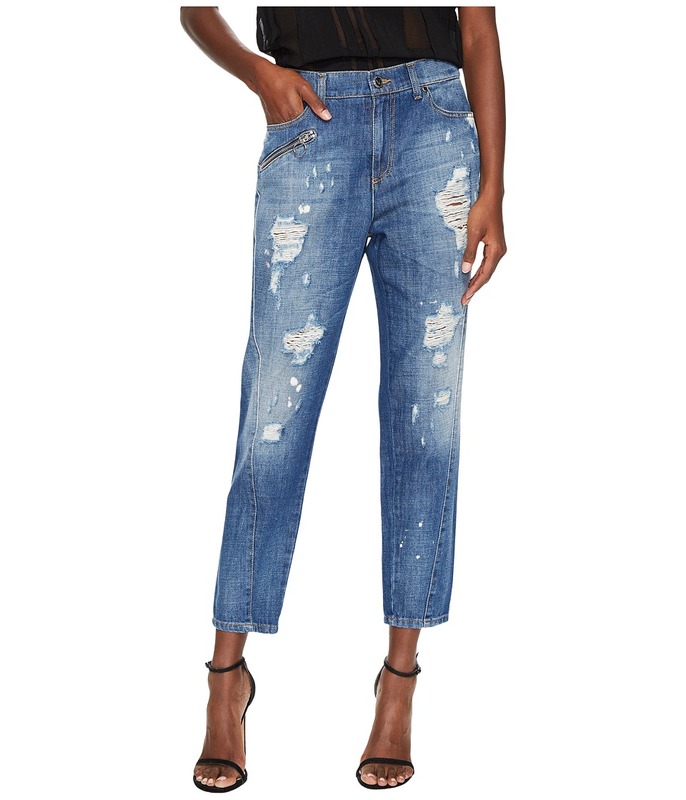 Achieve an edgy look wearing the Versace Jeans Distressed Boyfriend Light Wash Jeans. Regular fit, crop pant. Fitted waist. Front button and zip closure. Five-pocket construction. Whisking and distressed detail for that worn in look. 100 percent cotton. 65 percent polyester, 35 percent cotton. Machine wash cold, line dry. Made in Italy. This item may ship with an attached security tag. Merchandise returned without the original security tag attached or a damaged tag may not qualify for a refund. Measurements: Waist Measurement: 30 in Outseam: 35 1 2 in Inseam: 26 in Front Rise: 10 1 2 in Back Rise: 14 1 2 in Leg Opening: 11 in Product measurements were taken using size 26. Please note that measurements may vary by size. Get ready for fast paced style with a bit of spice wearing the Versace Jeans Side Cinched Belted Skirt. A-line silhouette. Fitted waist. Back zip closure. Side cinch adjusters. Straight hemline. 77 percent rayon, 20 percent nylon, 3 percent spandex. Lining: 100 percent polyester. Hand wash cold, hang dry in shade. Made in Italy. This item may ship with an attached security tag. Merchandise returned without the original security tag attached or a damaged tag may not qualify for a refund. Measurements: Skirt Length: 16 in Waist Measurement: 26 in Product measurements were taken using size 38 (US 2). Please note that measurements may vary by size. 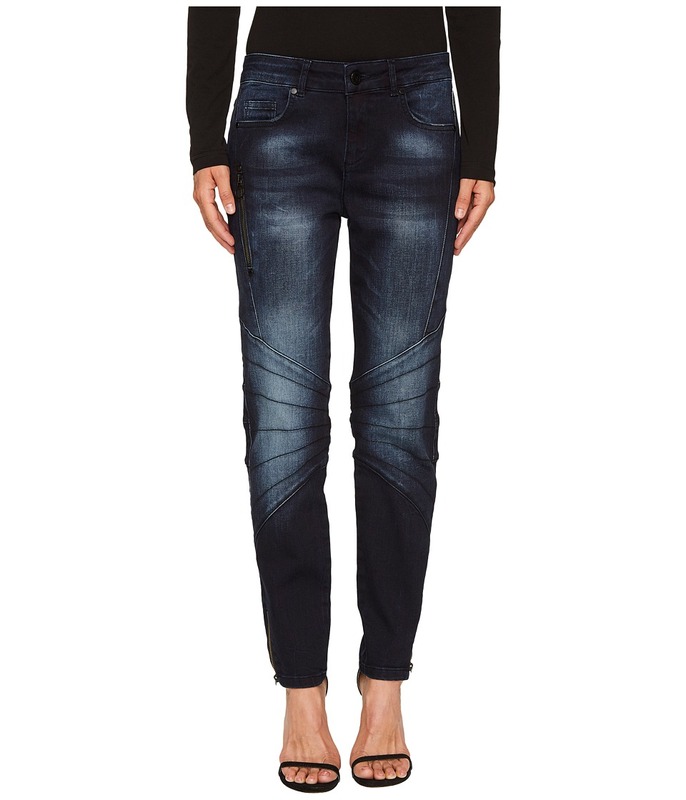 Display your worldliness wearing the Versace Jeans Asymmetrical Zip Long Sleeve Jacket. Crop style jacket. Lapels. Long sleeves. Asymmetrical front zip closure. Asymmetrical hemline. 70 percent viscose, 25 percent polyamide, 5 percent elastane. Hand wash cold, lay flat to dry in shade or dry clean. Imported. This item may ship with an attached security tag. Merchandise returned without the original security tag attached or a damaged tag may not qualify for a refund. Measurements: Length: 17 in Product measurements were taken using size 38 (US 2). Please note that measurements may vary by size. 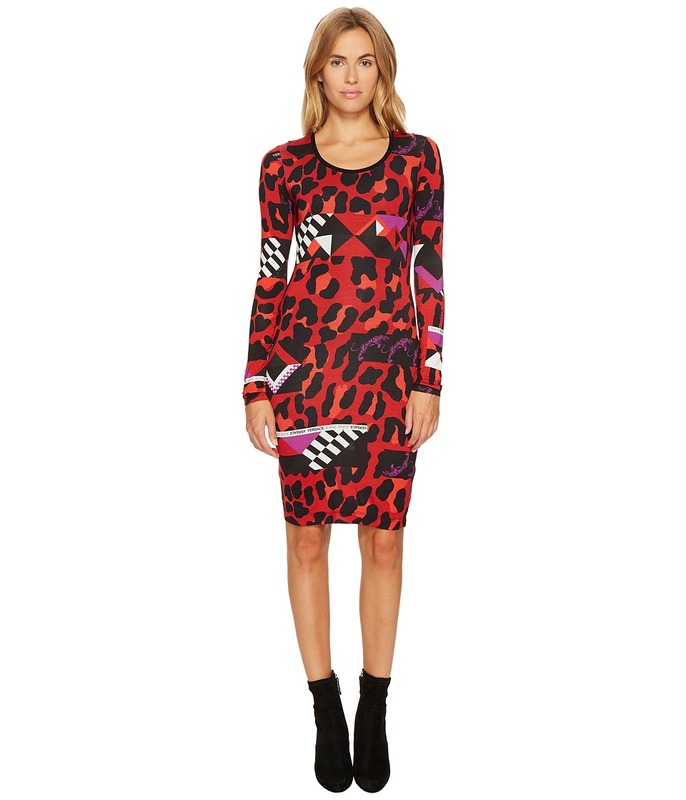 Embrace your inner wild side wearing Versace Jeans Geo Animal Long Sleeve Scoop Neck Dress. Shift silhouette. Scoop neckline. Long sleeves. Allover geo animal print. Pull-on construction. Straight hemline. 95 percent viscose, 5 percent elastane. Secondary: 100 percent cotton. Lining: 100 percent polyamide. Hand wash cold, dry flat. Imported. This item may ship with an attached security tag. Merchandise returned without the original security tag attached or a damaged tag may not qualify for a refund. Measurements: Length: 37 in Product measurements were taken using size 40 (US 4). Please note that measurements may vary by size. Hail the call of the fashion deities wearing the Versace Jeans One Shoulder Long Sleeve Dress. Sheath silhouette. Asymmetrical neckline. Long sleeve at right and should strap with D ring hardware at left. Back zip closure. Straight hemline. 90 percent polyester, 10 percent elastane. Lining: 100 percent polyester. Professional clean only. Imported. This item may ship with an attached security tag. Merchandise returned without the original security tag attached or a damaged tag may not qualify for a refund. Measurements: Length: 35 in Product measurements were taken using size 40 (US 4). Please note that measurements may vary by size. Lead the way to fashion utopia wearing the Versace Jeans Chevron Sleeveless Dress. Sheath silhouette. Jewel neckline. Sleeveless. Shoulder straps with snap closures. Back zip closure. Cutout detail at shoulders. Allover tonal chevron print. Straight hemline. 100 percent polyamide. Secondary: 70 percent viscose, 25 percent polyamide, 5 percent elastane. Hand wash cold, hang dry. Imported. This item may ship with an attached security tag. Merchandise returned without the original security tag attached or a damaged tag may not qualify for a refund. Measurements: Length: 37 in Product measurements were taken using size 38 (US 2). Please note that measurements may vary by size. 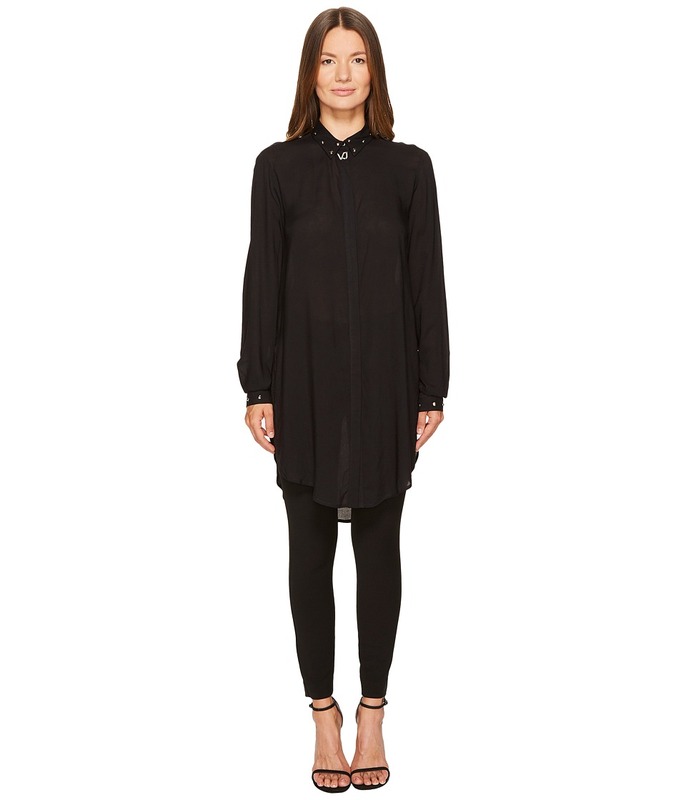 Highlight your beautiful figure wearing the Versace Jeans Side Cinched Long Sleeve Dress. Sheath silhouette. Long sleeves. Pull-on design. Cinched detail at the waist. Ruffled skirt. Straight hemline. 95 percent rayon, 5 percent spandex. Professional dry clean only. Made in Italy. This item may ship with an attached security tag. Merchandise returned without the original security tag attached or a damaged tag may not qualify for a refund. Measurements: Length: 37 in Product measurements were taken using size 38 (US 2). Please note that measurements may vary by size. 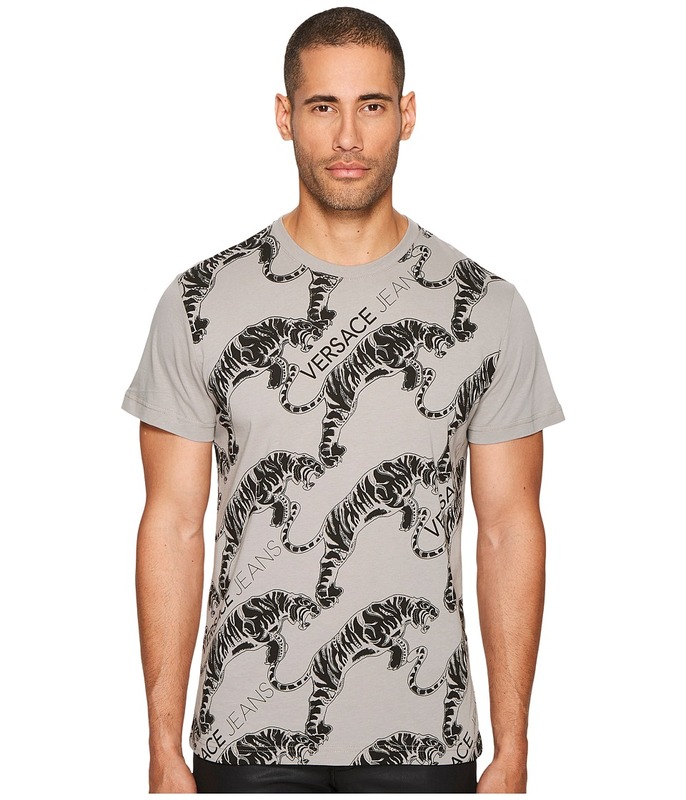 Even your casual look is eye-catching with the Versace Jeans T-Shirt. Crew neckline. Short sleeves. Kaleidoscope pattern throughout. Straight bottom hem. 100 percent cotton. Professional dry clean only. Imported. This item may ship with an attached security tag. Merchandise returned without the original security tag attached or a damaged tag may not qualify for a refund. Measurements: Length: 27 in Product measurements were taken using size MD (US 40). Please note that measurements may vary by size. 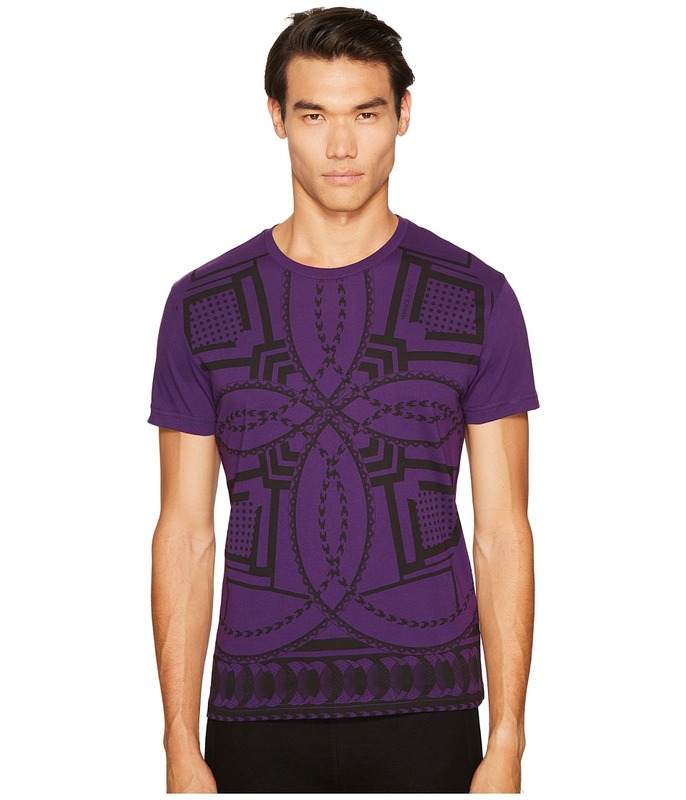 Even your casual look is eye-catching with the Versace Jeans T-Shirt. Crew neckline. Short sleeves. Tiger pattern throughout. Straight bottom hem. 100 percent cotton. Machine wash cold, line dry. Imported. This item may ship with an attached security tag. Merchandise returned without the original security tag attached or a damaged tag may not qualify for a refund. Measurements: Length: 29 in Product measurements were taken using size MD (US 40). Please note that measurements may vary by size. 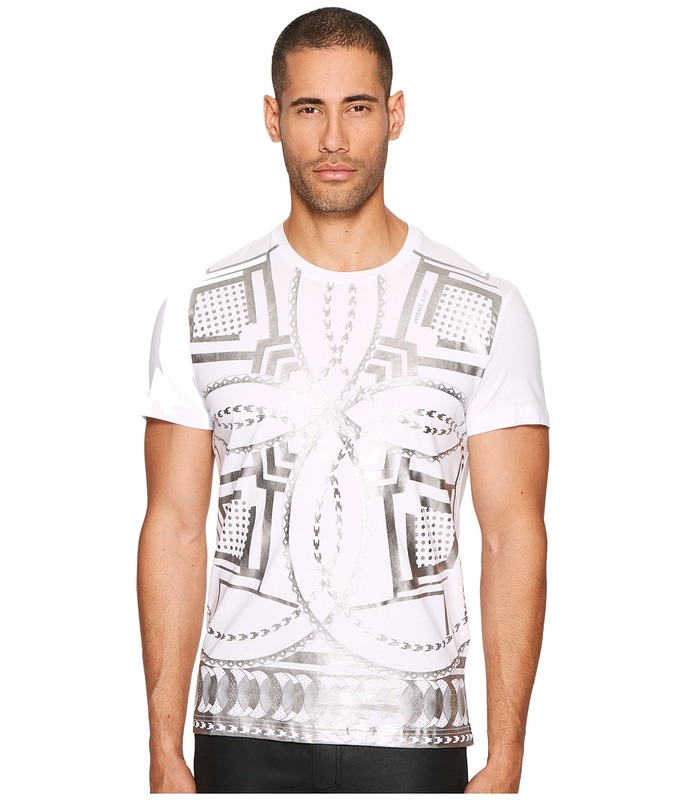 Even your casual look is eye-catching with the Versace Jeans Baroque Print T-Shirt. Crew neckline. Short sleeves. Baroque print throughout. Straight bottom hem. 100 percent cotton. Professional dry clean only. Imported. This item may ship with an attached security tag. Merchandise returned without the original security tag attached or a damaged tag may not qualify for a refund. Measurements: Length: 28 1 2 in Product measurements were taken using size MD (US 40). Please note that measurements may vary by size. 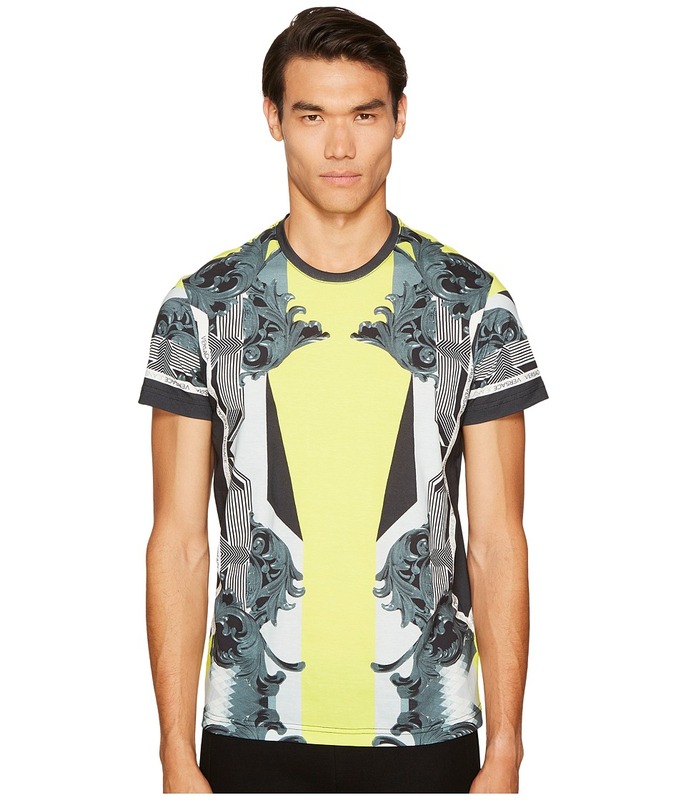 Even your casual look is eye-catching with the Versace Jeans T-Shirt. Crew neckline. Short sleeves. Logo stripe down the front. Straight bottom hem. 100 percent cotton. Machine wash cold, line dry. Imported. This item may ship with an attached security tag. Merchandise returned without the original security tag attached or a damaged tag may not qualify for a refund. Measurements: Length: 28 in Product measurements were taken using size MD (US 40). Please note that measurements may vary by size. 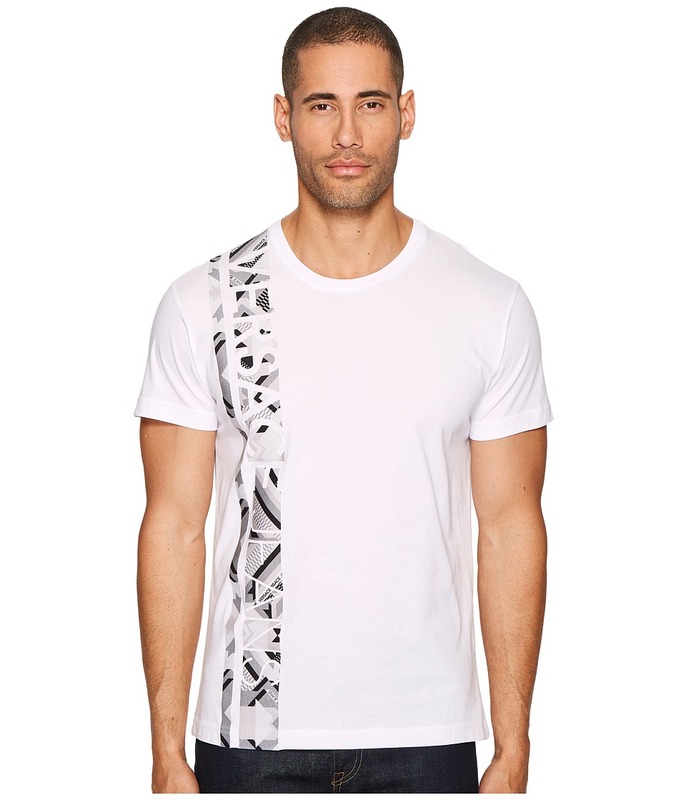 Even your casual look is eye-catching with the Versace Jeans T-Shirt. Crew neckline. Short sleeves. Kaleidoscope design at the front. Straight bottom hem. 90 percent cotton, 10 percent elastane. Machine wash cold, line dry. Imported. This item may ship with an attached security tag. Merchandise returned without the original security tag attached or a damaged tag may not qualify for a refund. Measurements: Length: 28 in Product measurements were taken using size MD (US 40). Please note that measurements may vary by size.